Q Is LiEr your real name? A Yes. It is my official middle name. Q What is ikatbag? How do you pronounce it? A "Ikat" is pronouced "Ee- kutt". Ikat is a woven fabric - generically any fabric whose individually-colored strands make up the final pattern of the fabric. "Ikat" means "to bind" - the fibers are tie-dyed before being woven with other fibers to form the fabric. When I was a lot younger, some of my first commercial projects were bags- especially backpacks, and I made them with ikat. I picked that name for this blog because most of the other names I thought of were already taken. Q What camera do you use? A I'm astounded and flattered that you'd even ask. I take very mediocre photos at best. I use my husband's Nikon D5100. And before that, we used the Nikon D40. And I try to only take photos in the daytime, and outside, even in the winter. My husband takes much, much better photos, especially of our kids. I can't even get the settings of the camera right, but I'm learning! Q What photo-editing software do you use? A Aperture on our Mac. Aperture is primarily our photo-organizing software, but it has built-in photo-editing features. Q What program do you use to write your patterns? A Pages on our Mac. It is like Microsoft Word, so it's just a wordprocessor/frontpage thingy, NOT a pattern program. I draw my templates by hand with a black felt-tip pen. Q Why haven't you written a book yet? A Who says I haven't? I wrote and illunstrated two entire book series(es) for my younger brother when I was a child. I'd tell you their titles but then I'd have to shoot you. Q When do you find time to sew? A Whenever I can. When the kids were young and took naps, it would be during their naptimes. Now that no one naps, not even me, I sew throughout the day, in short spurts. I dislike sewing at night, but when there is a deadline, I have to, which makes me unhappy. Q What sewing machine do you have? A A Pfaff Classic 1525. It has very basic stitches, is not computerized, but has an integrated walking foot which I find very useful. And while it is not an industrial strength machine, which someday I want to buy, it has a heavy-duty motor that enables it to sew through layers and layers of thick dense fabric. Q What serger do you use? A A Pfaff Hobbylock. Forgot the model. It is about the most basic of the Pfaff sergers. It has 2 needles and 4 spools. Q Why do you like cardboard so much? A Because it is supreme. Q Where do you buy your fabric? A From actual physical stores where I can touch it and feel its weight, drape, content etc. Mostly I go to JoAnn fabrics, and Mill End Textiles, a local chain. Occasionally, when the feel of the fabric is not important, I will shop at www.fabric.com. I have also made a couple of purchases on etsy, and bought some nice knits at www.chezami.com during their rock-bottom sale. Q Where and when did you learn to sew? A From mum, an aunt, grandma and homec teachers. I started hand-stitching at about 8, and using the machine at about 13 (I think). Q Have you really never used a commercial pattern? A Yes, I have never really used a commercial pattern. It wasn't how I was taught to sew, growing up, so I can't do it now. I feel compelled to see how a pattern originated from a person's unique dimensions before I am motivated to use it. I am working on learning to use a commercial pattern someday soon, because they are good starting points for when I am too lazy to draft something from scratch myself. Q What resources can you recommend for people wanting to learn to draft clothes patterns? A A dressmaker's school or similar classes, some useful websites and some books. You might like to read my rambling post on that here. I have also reviewed a few drafting books I own - you can find and read the reviews by clicking on the "Reviews" category in my sidebar. Q Do you take custom orders? A Not for clothes, slopers or patterns. Yes, for toys, bags and other one-size-fits-all products. But it also depends on how busy I am at any particular time. Email me lier(dot)koh(at)gmail(dot)com and we can talk. Q Do you offer a commercial license for your patterns? I'd like to make some toys from your patterns and sell them at craft fairs/to friends. A Not at this time. My patterns are meant for personal use and for gifts and not for profit i.e. they are not meant for sale, even in limited quantities. However, it is possible to may make and sell them if all profits are donated to charity - email me (email addy in para above) if you have questions and to find out my policy for non-profit sale of items made from my paid patterns, free patterns and tutorials. Requests will be considered on a case-by-case basis. Q I want to translate your tutorials into (some other language) on my website because my readers don't understand English. Can I repost your entire tutorial in my language of choice, including using your photos? A No. There are many free programs to translate and entire site into a different language. 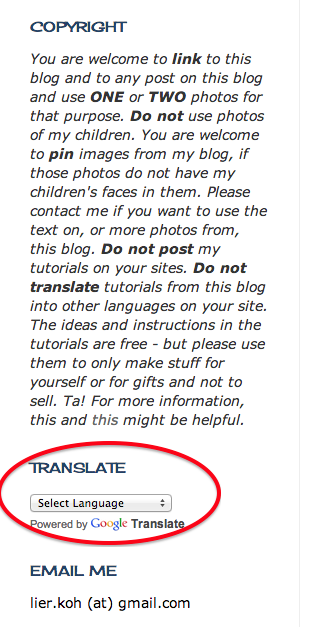 I have also added a translator widget in my sidebar just under my copyright notice. 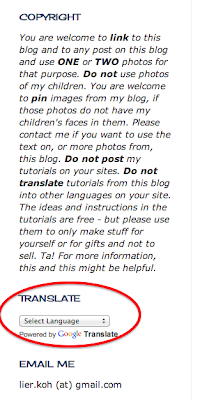 Please direct your readers to my site to read my tutorial at its original source - they will be able to translate it on-site into the language of their choice. Q My child is interested in sewing. What can I do? A Jump on in with him/her. This post might give you ideas. Also this one. Q I bought an IKEA sewing machine (SY) and I need a manual in English. Will you send me yours? Or painstakingly scan every single page and then email those to me? Or tell me where I can otherwise get my hands on it? A A reader sent me this link. Give it a shot. Q Will you sell me your daughters' Halloween costumes? Or any other clothes you made for your daughters? Q I saw your (such-and-such-a-project) on your blog but there is no accompanying tutorial (or pattern). Will you email me a pattern and instructions? Q I saw your (such-and-such-a-free-pattern) on your blog but it didn't come in the size my child is. Will you size the pattern for me and send it to me? Q Are you accepting sponsors and advertisers? Q Do you write sponsored posts? A No. But I accept paid assignments that e.g. a tutorial for your magazine. Q Do you write reviews? A Occasionally, when I find something I like using and think my readers will enjoy using, I might review it on this blog. These are things I actually use myself, like dressmaking books, sewing machines, tools, craft products and even shops. Sometimes these reviews will be of products that have been sent to me, unsolicited, for free and that I (or my children) have liked. I will indicate this in those reviews. Q If I send you a free sample of my product, will you write a review on your blog? A You are welcome to send me any amount of free stuff with the understanding that I am not obliged to review it, give you private feedback or write a public post about it. Depending on how much time I have, how relevant your product is to my blog content and audience and how much I and my kids love your product, I may write a positive post about it, write a negative post about it, send you feedback, ignore it completely, give it away or something else. If you are still interested in sending me your product, please email me at lier(dot)koh(at)gmail(dot)com and we can talk. Q Why can't I find anything in your etsy store most days? my yearly batch of all-new Lunch Buckets around May/June. I make buckets as end-of-the-school-year gifts for my girls' teachers, and I usually make close to a dozen more just to put in the shop for folks to buy. pre-Christmas/holiday shopping. Depending on how busy I am that year, I usually aim to make some items for the shop in time for the holidays. random samples that I don't want to keep after photoshoots. These are brand-new samples that I make for blog tutorials, patterns and publication. Often, I make multiples in different fabrics for photoshoots and only need to keep one (if any). The rest go in the shop so you guys can adopt them and give them good homes. I will always make blog announcements whenever new items are in the shop, so people can go shopping!